"The Israeli occupation soldiers shoot at our children only because they want to murder the Palestinian future, or to make them disabled if we choose the less racist option – and the problem is 'the leaders of the resistance' in the wounded Gaza Strip do not understand this! […] We are not absolving the Israeli occupation of responsibility for this matter, as it is continuing the criminal persecution of our children in order to destroy their tender lives… However, just as we pursue the occupation, so too there is no choice but to pursue those who are still placing our children’s lives in danger from the Israeli killing bullets through their populist displays. We must not be silent any longer about this matter. Palestine has the right that its children will learn and grow in order to be pillars of the future of freedom and independence, and the children in Palestine have the right to be protected and defended by it [Palestine] so that they will live their lives in happiness." Article in official PA daily glorifies Martyrs and Martyrdom, describes Palestinian kids trying to touch the Martyr's body to gain prestige among their fellows, Martyrs are "grooms"
When parting from the Martyrs, there are always symbolic images that remain in the mind and heart, and it does not matter how much time has passed. Here, at the parting from the Martyr, a father stands facing his son and gives him a military salute. 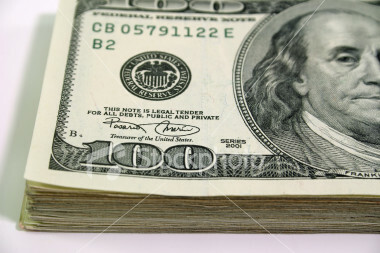 This is an image that has repeated itself many times. In a different image, a boy is hanging out the window of a room and watching the parting from the Martyr... He comes out quickly and tries to touch the head of the Martyr. He wants to reach the glory in order to brag to his friends that he touched a Martyr, but he did not succeed. When the body of the Martyr reached his home, his closest friend Ata looked for the Martyr's mother and shouted: 'We have brought you the groom; we have brought you the groom.'" 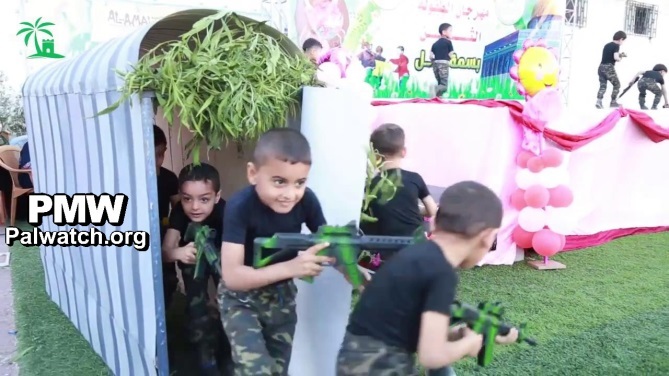 The children in the kindergarten put on a performance while armed with toy weapons and wearing military uniforms and Islamic Jihad headbands. They simulate killing other children playing Israeli soldiers dressed as ultra-Orthodox Jews and abducting their bodies, after the “Israeli soldiers” attacked children playing Palestinian civilians. A Hamas song in Hebrew is played in the background. If you have not yet been killed, captivity is for you. I will make you drink the cup of death, what a bitter taste..."
“Imad Arif, a 56-year-old from Gaza City, did not find another way to express his solidarity with his son Bassel (i.e., terrorist, murdered 1), who is imprisoned in the Israeli occupation’s prisons, other than by joining the unlimited hunger strike. This father has not seen his prisoner son since his arrest in 2002 due to security reasons, to the point that according to him he no longer even remembers how he looks, and his mother is the only one who can visit him. Bassel was arrested on Aug. 19, 2002, as he was wounded during work in the Palestinian [PA] police in Ramallah in the West Bank, and was sentenced to 2 life sentences and another 52 years. Bassel Arif – Palestinian police officer who carried out a shooting attack near the Israeli town of Ofra on May 28, 2002, murdering Israeli citizen Albert Malul and injuring 1 other person. He is serving 2 life sentences. In the top picture, a picture of Yasser Arafat and the Dome of the Rock hangs on the wall on the right, and next to Arafat is written "Martyr (Shahid), Martyr, Martyr," referring to Arafat's well-known statement: "They want me as a prisoner, a refugee, or dead. I say to them: 'Martyr, Martyr, Martyr.'" 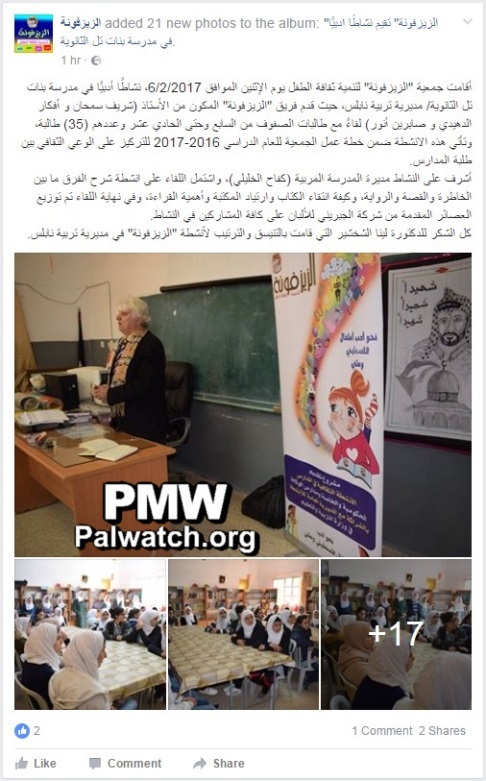 Posted text: "The Zayzafuna Association for Development of Children's Culture today, Monday, Feb. 6, 2017, held a literary activity at the Tell High School for Girls in the Nablus Education Directorate (i.e., under the PA Ministry of Education), as part of which a group from Zayzafuna met… with 35 students from grades 7 – 11." He announced: For the sake of Jerusalem my path is burning. We, Fatah, are a storm, and our blood is food for the revolution..."
PA TV host: "Bravo, Muhammad, thank you, thank you, thank you!" Majd Al-Khaddour – Palestinian female terrorist who carried out a car ramming attack outside of Kiryat Arba, near Hebron, on June 24, 2016. Al-Khaddour attempted to ram her car into a hitchhiking station but hit another car, wounding the two Israelis inside. During the attack Al-Khaddour was shot and killed by Israeli soldiers. Al-Khansa - an Arab woman and poet from the earliest period of Islam (7th century) famous and honored in Islamic tradition for rejoicing when all four of her sons died in battle as Martyrs. She has been lauded by the PA and often presented as a role model for mothers, and the PA has named 8 schools after her. Yasser Dhiab Hamdouni was serving a life sentence for participating in the murder of Israeli citizen Avner Maimon in the Palestinian town of Ya'abad in the West Bank (June, 12, 2003). Hamdouni, a member of the Al-Aqsa Martyrs’ Brigades (Fatah’s military wing), died on Sept. 25, 2016, after collapsing while exercising in the Israeli Rimon Prison yard. Text and pictures on the official Fatah Facebook page. The pictures show terrorist Issa Taraireh, who was shot and killed while trying to stab Israeli soldiers on Sept. 20, 2016. 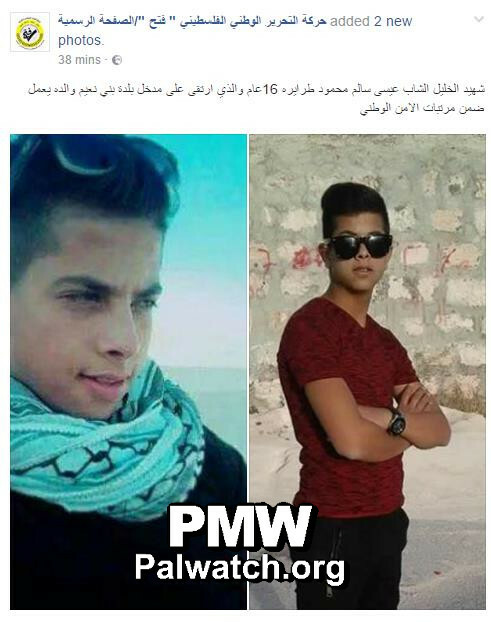 Issa Taraireh – 16-year-old Palestinian terrorist who tried to stab Israeli soldiers at the entrance to Bani Na’im east of Hebron on Sept. 20, 2016. The soldiers shot and killed Taraireh. Taraireh was a relative of Muhammad Taraireh, who stabbed and murdered 13-year-old American Israeli Hallel Yaffa Ariel as she slept in her bed in her home in Kiryat Arba near Hebron on June 30, 2016. Official PA TV reporter: “After the occupation’s bulldozers demolished the homes of the three Martyrs from Qabatiya south of Jenin (i.e., terrorists Ahmad Najah Abu Al-Rub, Ahmad Zakarneh, and Muhammad Kmeil), who died after they carried out the Damascus Gate operation (i.e., terrorist attack, 1 murdered) in occupied Jerusalem last February , and [the home of] the prisoner that the occupation government is accusing of providing them with aid (i.e., Bilal Abu Zaid), the [PA] leadership ordered the building of new homes for their families. Jerusalem Legal Aid and Human Rights Center researcher and fieldworker Nabil Abdallah: "When children [who attempt to carry out attacks] are presented here as heroes, particularly in our media, there are times when the child wants to imitate role models and heroes, and may decide [to carry out an attack] while unaware of the consequences... Our media needs to raise awareness and convey to the world that this child is a victim, not just a hero. [By calling him] "a hero" we are seriously taking part in destroying his childhood... This is a problem - we know how much the media influences... Children like Ali or Muawiyah [Alqam who stabbed an Israeli] need to live their lives." Palestinian father to soldiers: "Shoot this little boy, after all you always do that to small children! Shoot! Shoot! Shoot him! Go, go! (unclear) Shoot him, heroes!" Palestinian father to son: "Go, go! Don’t be scared! Don’t be scared! (unclear) Raise the flag! Raise, raise!" Palestinian father: "Let them shoot and kill him! Kill him, shoot him!" Palestinian father to soldiers: "Shoot him! After all you are always doing things like this. Always shooting small children and killing them. Shoot this one! Should I bring you more?" Palestinian father: "(Unclear). Let them shoot and kill him!" Palestinian father to son: "Raise the flag! Don’t be scared! Throw the rock! Throw! Throw! Throw!" Bombing of Israel's National Water Carrier - Eilabun tunnel attack - On Jan. 1, 1965, Palestinian terrorists attempted to bomb Israel's National Water Carrier. This was the first attack against Israel carried out by Fatah. Fatah refers to the attack as the “Intilaqa”, meaning “the Launch” of Fatah. "It is our duty to prevent our sons and daughters... from carrying out futile acts, which the enemy in his media and diplomacy has begun to link to the acts of the terror organizations in Paris and elsewhere, in order to strip us of our humanity, and play the role of the human. This is while, there is no one else in the world, except for him [the enemy], who boasts about occupying someone else's land and oppressing its owners. Moreover, we should note that after the events of September [11, 2001] in New York, [then Israeli Prime Minister Ariel] Sharon copied the term 'terror' used to refer to those attacks, to our national struggle (i.e., terror campaign - Intifada). I warned about this at the time, and called to keep a low profile until the New York turmoil had passed, but the concept of 'Palestinian terror' later spread, instead of [the general term] 'terror.' Now, after the Paris attacks, we must keep a low profile so that we are not charged with the crimes of ISIS and its ilk, because the world is in a coma, and it may not wake up from it anytime soon. We must learn our lessons and wait." “Hundreds of Hebron’s residents accompanied to burial the body of Martyr Ibrahim Samir Skafi, 22, who ascended [to Heaven] from gunfire of the occupation forces, after they left him to bleed [based] on the pretext that he rammed his car into soldiers next to the Al-Hawawir junction, in northern Halhoul, and injured two of them…. Governor of Hebron District Kamel Hamid said during the funeral that the continued holding of the bodies by the occupation stirs up emotions and leaves the area in an impassioned state. Likewise, he noted that there is no excuse to hold bodies, except to exacerbate the violations against our people and its rights. Mayor of Hebron Dr. Daoud Al-Zaatari emphasized that the occupation forces will not succeed in breaking the will of our young people through the executions they continue to carry out against our young, and emphasized that a people that sacrifices the blood of its young for freedom will win. Ibrahim Samir Skafi – 23-year-old Palestinian terrorist who rammed his car into 3 border policemen at the Halhoul junction near Hebron on Nov. 4, 2015, wounding them. Skafi was shot and killed by soldiers. Border Policeman Benjamin Yakubovich, 19, was mortally wounded in the attack, and died from his wounds on Nov. 8, 2015.